it's crap! In a funky skillo sort of a way. Another game from sunteam, who seems to be going for the record number of games submitted in a year which is currently held by… checks old threads on WoS… phew, it’s not me. 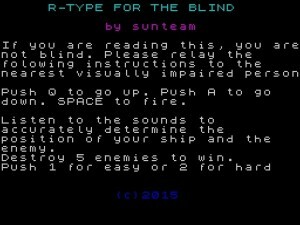 This time he’s very thoughtfully remade the classic arcade shooter R-Type for the enjoyment of blind and partially sighted people. This may seem a bit tasteless to some, but I think it’s a nice thing to do. Crap Spectrum games should be enjoyed by everyone, not just those with 20-20 vision! It’s another .dsk image – boooo! – but at least this time it makes use of the 128k machine’s PLAY command, so don’t try loading the converted tap on a 48k machine unless you like seeing the C Nonsense in BASIC error. Although you won’t notice if you’re blind, of course. 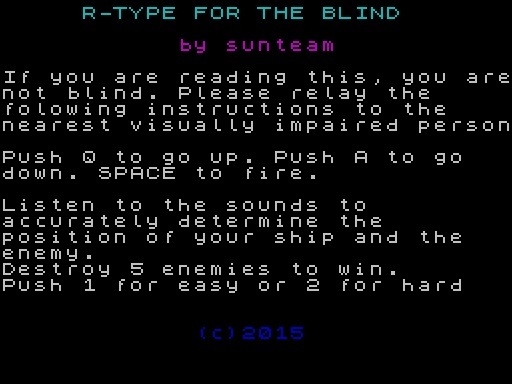 Oddly the first line of the game contains a REM statement with the title R-TYPE FOR THE DEAF. I can only assume this was sunteam’s original idea, before he realised that a version of R-Type with no sound already exists. It’s called R-Type. Ah, now that’s clever. The game follows the “fly about and shoot stuff” narrative of R-Type, but with one crucial difference – with no graphics, it’s down to your ears to interpret what’s going on in the game. This could well be the perfect game for large-lugholed Sir Clive Sinclair impersonator, Alexander Armstrong. Being a musical chap whose one and only talent is having perfect pitch, I actually quite enjoyed this – the lack of graphics didn’t stop me from winning the game on my very first go. 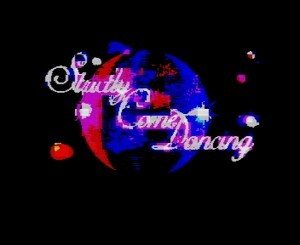 Or at least that’s what I gathered from the bleepy tune I heard before being dumped back to the main menu. I wonder if with a bit of polish and perhaps the odd speech sample via a Currah interface it’d be a genuinely playable game – I hope this doesn’t mean sunteam is losing his crap touch! If you want to boil an egg and feel you can’t handle the stress of knowing when to take it off the boil then can I suggest you eat bacon tonight rather than look to this hunk of crap to help you out. Yes, it is another effort by sunteam! The opening page does not hold much confidence about how this program is going to pan out (pun intentional – ed.). Firstly, who in their right mind would chose to flash magenta and green full screen? I can only assume this was written on a faulty spectrum whose ULA’s “bit 7” was stuck on “FLASH”. The usual failure to correctly word-wrap and word-space is encouraging to see through. Onto the game… A dismal representation of your egg (albeit round, not oval, or even ovoid) resides to the lower left of the screen. Despite however, the poor representation of your zygote containing organic vessel, the author did at least have the insight to represent the pin prick. At the top of the screen an annoying counter increments as some rate of knots to a loud din. All this however, is pretty irrelevant due to the massive FLASH element which still takes centre stage. As your brain haemorrhages to the sound of the annoying egg timer and FLASHING SCREEN, you start to wonder if you could actually stomach an egg or throw up all over your beloved speccy and tele with a vague misguided hope of relief from THE BLOODY FLASHING SCREEN. Don’t ask me what number the timer goes up to – my eyes were bleeding after about 100 so it’s anyone’s guess. Once the egg timer completes (I’m sure it only ran for about 40 seconds, although to be honest, it felt like 4 hours) you have about 30 milliseconds to take your egg out before you are not-so-politely informed that you failed and that the game is over IN FULL FLASH MODE. A quick hack into the code suggests if you were to press “e” during the infinitesimally short “REMOVE THE EGG QUICK” phase, you might actually be able to win… except the author appears to have omitted the “win” code from line 800 onwards, so failure is inevitable. Why sunteam chose to release this on a +3 disk is anyone’s guess. I ran the converted tape version on ZX Spin emulating a 16K Spectrum and it worked perfectly. Well, err… you know what I mean!? A worthy crap contender, but one that should have a warning to epileptics on the cassette cover. “May contain flashing images” just doesn’t seem to quite cut it. Anyway, my grandmother said it takes 3 minutes to boil an egg, not 4, so clearly this program is crap. Here’s the first of several entries from sunteam, who despite the “team” part of the name is one bloke called Paul (or perhaps a seven-year-old boy called Paul, judging by the rather silly title of this game). This is also the first game optimised for the +3, a machine I could only dream of back in 1988 when my ageing 48k Spectrum + was on its last membrane. 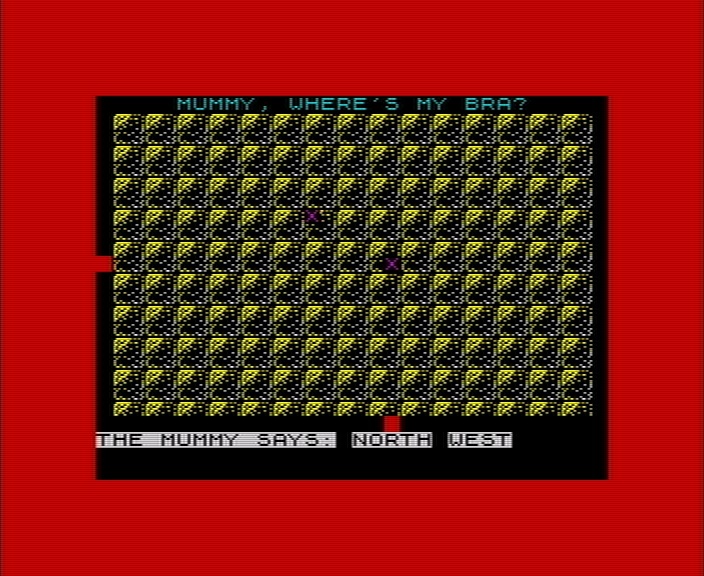 In practice, this means I have to not only change the settings on my emulator, but actually go into +3 BASIC and type LOAD “MUMMY.BRA” (rather than typing LOAD “” or pressing Enter) to get the thing to work. Immediate bonus crap points for inconveniencing me! Let’s hope it’s worth it! Oh. It’s stopped with an OK message. I don’t think I ever even saw a +3 back in the day so this is all alien territory to me. Well I’m looking forward to the amazing soundtrack and hi-res graphics… so I type RUN (yet more inconvenience, if this was in 48k mode I could just tap R) and the first thing that hits me is the fantastic theme tune, which cleverly has the same number of syllables in it as the title, meaning you can sing along to it (rather like The Sweeney in the 1970s). “Mummm-EEEE, where’s my BRAAAAAA!”. I’m sure this sort of audio wizardry wouldn’t be possible on a 48k or even a bog standard 128k Spectrum, oh no. There’s also a redefine keys option with a similar tune (“Reeeeeeee-deeeeeeeee-fiiiiiine KEEEEEEEEEEEEEEYS!”) although sadly this freemium option is not available until 2018. I look forward to it! Anyway, to the game. You play Spectra, a voluptuous 17-year-old girl (vital statistics 128-48-128) who appears to have lost an item of clothing, and asks her 23-year-old stepmum Clivella (also scantily clad) to help her find it. The stunningly detailed graphics – only possible on a +3 – show every curve of Spectra’s body, from her taut [%$*#&] to her succulent [£””*&#@] and even at one point, a glimpse of her inviting [&*£$% £$%@]! The promise of a game making full use of the +3’s hardware? A title which made me think I’d be playing a teenage girl rummaging around in a laundry basket? I’m the first to admit I was a little curious and couldn’t resist taking a look at this. It didn’t live up to expectations. Apparently my friend “Bra” (not sure what that’s short for, possibly “Brad”) is kidnapped and hidden inside an egyptian tomb. The mummy gives hints as to where “Bra” is, but with only four attempts there’s no chance of succeeding and little fun in guessing. Utter pants. Thank you Chris. As to the score, I give it 32A percent – because it falls a bit flat. Anyway. It seems our “Geff” has different strengths to his near-namesake – he’s a bit of a wiz with numbers. 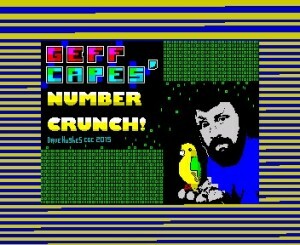 Following an impressive animated sequence (if you’re impressed by blocky pictures of bearded blokes with frightening red eyes) and some pointless yet somehow comforting random bleeping, we come to the point of the game, which is – and this is such an obvious idea I can’t believe it hasn’t been done before – hexadecimal and budgerigars! YES! So a graphical representation of a binary number is displayed, alongside a graphical representation of Geff, and you have to convert this number to hex to win a budgy (because in Geff’s world, a budgie is called a “budgy”. Obviously.) Take too long to work it out, and you lose a budgy. Get the number wrong, and Geff takes away eight of your feathered friends, like the budgy-hoarding git he is. And we’re off! First out of the starter’s block is Colin Woodcock, a veteran of the Spectrum scene – he’s even written a book called The ZX Spectrum On Your PC. With credentials like that I have high hopes for this game. In Colin’s own words, “Enjoy the glamour and sparkle of ballroom dancing in this stunningly realistic strategy adaptation of BBC1’s hit TV show.” Well, at the time of writing it’s a Saturday evening, so it only seems right to play it now given that I’ve had the bloody thing rammed down my throat every Saturday evening for four months of every year since 2006. There follows a BEEPy rendition of the theme tune, which loses crap points for sounding far too much like the original, but gains points for repeating just enough times to become annoying. Also, pressing a key has no effect whatsoever other than eliminating the pauses and speeding the tune up just a bit. Then we come to the game. No instructions, just straight into Week One. American smooth, apparently. Sounds more like a cup of coffee than a dance. Perhaps I can dunk my raison d’etre into it. I only know two dances – the “six pint shuffle” and the “embarrass your kids in front of their friends dance”. Oh, and there’s that annoying beepy tune again. Four bloody times. Again. Finally, the strategy element of the game kicks in. With 40 hours to practice, and with that tune still ringing in my ears, I had no idea how to split my time – so I just punched numbers into the keyboard at random, imagining that each key I punched was Colin’s head. But how did I do on my first go? As for the scores… I give this game se-vennnn! Thanks for all the crap games – we’ll do a proper round-up once all the games have been reviewed. leespoons on The results of the 20th CSSCGC are in! Simon Ferré on The results of the 20th CSSCGC are in!